Three months and Badwater later, we are back at the café in Kanjurmarg, Mumbai. Breeze Sharma looked tired but he seemed happy and relaxed in his black T-shirt with `Badwater’ written on it. 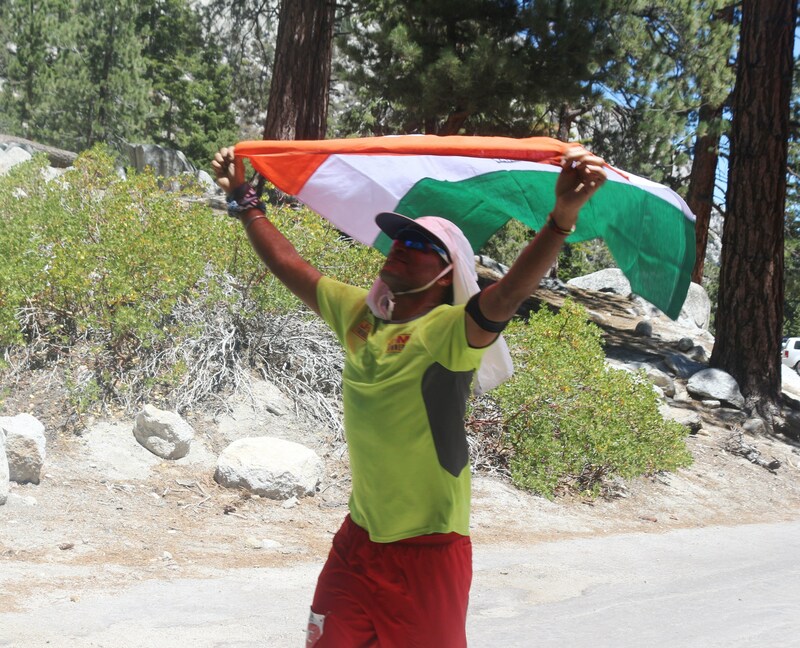 Ten days earlier in July, he had made it past the finish line of the iconic ultramarathon in California’s Death Valley, the second Indian after Arun Bhardwaj, to do so. Breeze summed up the Badwater Ultramarathon in two words: mind game. He reached the US on July 1, for the 2016 edition of the race scheduled to start 17 days later. For that period, he rested, doing just a 12 km-walk, one day in between. With bib collection due on July 17 at Furnace Creek, he reached there on the 16th. “ The temperature at Furnace Creek was around 120 degrees Fahrenheit,’’ he said. According to him, as an Indian he didn’t find the heat – the way it impacted as a new experience in new land – a killer. Hailing from Rajasthan, home to India’s Thar Desert and having lived the early part of his life there, Breeze suspects that early conditioning may have helped him. Further, compared to Mumbai where he came to work, live and run, Death Valley’s heat was devoid of humidity. “ It was dry heat. When the wind blew, it too was hot,’’ he said. That initial estimation was however tad misplaced for as Breeze discovered; the trying part was not the heat per se but its unrelenting persistence (even at night the temperature hovered at 100 degrees Fahrenheit) and a whole ultramarathon to run, amid that. Each outing at Badwater, no matter how well you got things covered, harbors an element of uncertainty. For Breeze, the race ambiance at Furnace Creek was a revelation. One of the best things he liked about Badwater was how the gathered ultra-runners treated runners of all levels of experience, equally. “ It was humbling for me to stand alongside some of the best ultramarathon runners around, runners who had years of experience. Some were veterans of Badwater who had run and completed the event several times,’’ he said. He also remembered the Race Director going out of his way to announce Breeze’s presence, a first timer at Badwater all the way from Mumbai, India. “ That felt nice,’’ Breeze said. The run got underway at 8 PM, July 18. His support crew anchored by US based-Vijayalakshmi Nadar moved with him. Breeze debuted at Badwater with a classic error of the running sort – he covered the first 21 km in 2 hours,18 minutes; a pace that would qualify to be a decent half marathon in Mumbai, except this wasn’t a half marathon but a 135 mile-long ultramarathon in Death Valley, one of the hottest deserts on the planet. For that distance, indeed almost up to 30 km, he was ahead of the pack. He realized his mistake, corrected and settled to a sensible, sustainable pace. Vijayalakshmi provided an overview of crewing. “ As the race got underway, the runners ran ahead and after a few miles, we follow, to pull a little ahead of the runner, to ice him (put ice under his cap, and tie some around his shoulder) and spray him. Hand over food items, including fruits and nutrition bars and let him pass. We pulled ahead every two miles or so through the race. My challenge was also to ensure that he didn’t stop for more than a couple of minutes each time. The first night of running was a breeze, the next day it started getting tougher,’’ she wrote in. Death Valley is an amazing place. “ The region and the route attract you,’’ Breeze said citing the austere beauty of the dry, hot desert despite the punishment it inflicts. At night, the sky was a clear canopy above runner’s head, dotted with millions of stars. We checked again – he repeated it, the way he said it at first: the desert attracts you; not the other way around. The mutual fascination played out fine for the first 100 km. At about 65-70 miles, he admitted he started feeling the heat; the dry arid environment austere in its beauty initially, also appeared bleak and devoid of anything different to motivate. An element of harshness set in. “ I would say that even the first 100 miles was alright, I must have covered that in about 29 hours of running. The question was what lay after that,’’ Breeze said. Beyond 100 miles, was an unknown quantum for him. In his journey to Badwater, he had run three 100 milers to qualify and knew what running that distance felt like. But he had no idea what 135 miles held in store. For runner getting progressively tired and hitting his limits, the additional 35 miles can be a veritable gulf to bridge. Breeze had reached out to Vijayalakshmi for support crew because she was one good friend he had in the US. Vijayalakshmi is a runner but she was new to running very long distances and crewing for it. In the support vehicle, she was having her own Badwater experience, learning first-hand what crewing entailed. Past the 100 mile-mark she figured Breeze was entering uncharted territory. “Though Breeze has run 100 miles effortlessly in an Indian situation, he has never pushed himself beyond that and he had no game-plan on how he would do the rest, except the confidence that he will do it. After he finished his 100 miles, I caught him slurring on one of the breaks because of lack of sleep and I decided that if I let him run alone now, on the isolated race course, it would be tough for him. We were still in the endless stretch of dry but very beautiful desert, lit only with stars and the moon, and only occasional runners and their crew vehicles passed us. I thought I will walk / run with him only for a couple of miles, but that stretched to the next 30 miles. I sang old Hindi hits, to cheer us up….I had to constantly remind him and me that we have a task to finish and we can rest later. We kept walking / running till day break when we reached Lone Pine, the last official break, before the final stretch, up the mountain, ‘’ Vijayalakshmi said. The Badwater course is a mix of desert and mountain environment. It is fully on road, starting at 279 feet below sea level in the Badwater Basin of California’s Death Valley and ending at an elevation of 8360 feet at Whitney Portal, the trail head to Mt Whitney. According to Breeze, the ascents on the hill section are not stiff but they can be long and winding. As you keep running, any incline can be testing. At around 8 AM on the third day – after a night of running followed by a full day and another night of running – Breeze hit the slopes leading to Whitney Portal. “ There we met Pete Kostelnick, eventual winner of the race who also set the course record. He pepped up Breeze a bit and he headed for his final stretch, up 13 miles ascending Mt Whitney Portal. With the sun beating down, when you have already put 122 miles behind you, and physically and mentally you are literally hanging by a thread, even walking those endless curves can be tough. While the crew including me waited ahead at the finish line, it was a relief to see Breeze come up with the national flag, which I had handed over to him, a couple of miles earlier,’’ Vijayalakshmi said. “ The last 13 miles was very slow for me, it took me five hours to cover that,’’ Breeze said, adding he owed much to his support crew. At noon on the third day, he completed his Badwater Ultramarathon in 40 hours 47 minutes. He had kept five pairs of shoes for the race. He used three; the hot road of Death Valley singed their soles. “ It was all in all a humbling experience for Breeze and me. While Breeze realised all that goes into preparing and running an international race like this, for me it was bags of learning about human behaviour in a stress filled race. It was only the next day, when we were driving through the entire stretch of the race venue, on our way from Lone Pine to Las Vegas that I stopped to marvel that Breeze ran all this distance on foot, and what a stupendous task that was…and I paused to pat my back for a job well done,’’ Vijayalakshmi said. A few realizations have dawned post-Badwater. Breeze firmly believes that he over-trained. “ I was running too much in Mumbai, preparing for Badwater. It should have been less. I should have rested adequately. In turn that would have kept more energy at my disposal,’’ he said. Further, in his relatively quick progression through a clutch of ultramarathons in India to Badwater in the US, he had failed to perfect a fluids intake system. “ I drink water as required. But everything I drink while running would only qualify as hydration, it cannot be counted as energy-providing,’’ Breeze said. The thing he hadn’t got used to and which he feels he should, in retrospect, are energy drinks. “ I don’t think there is really much difference between running 100 miles and running 135 miles. I was quite alright. What I missed at Badwater is the potential boost in energy I could have got from the occasional energy drink,’’ Breeze said. When you run an ultramarathon, it isn’t just enough that you have all this in your supplies for the road; you should have tried and perfected the practice before, for race day is not for experiments. Trying energy drinks earlier, finding which one works for you, at what point and in what quantity – all this, perfected earlier, would have helped. Food habits also interfere when race locations change. “ Breeze is a very conservative runner and hardly eats during races. He’s not used to nutritional supplements as well and though I had done my research on what the runners use for fuel on the way, he declined my suggestions. All he ate was cucumbers, cherries, oranges and grapes. The only real food we managed to get, a veggie wrap, was not to his liking at all, because it lacked chillies, which he cannot do without,’’ Vijayalakshmi noted in her email. Breeze would like to return to Badwater. Notwithstanding the desert’s changing face or its face as perceived by changing runner, Death Valley’s attraction remains. 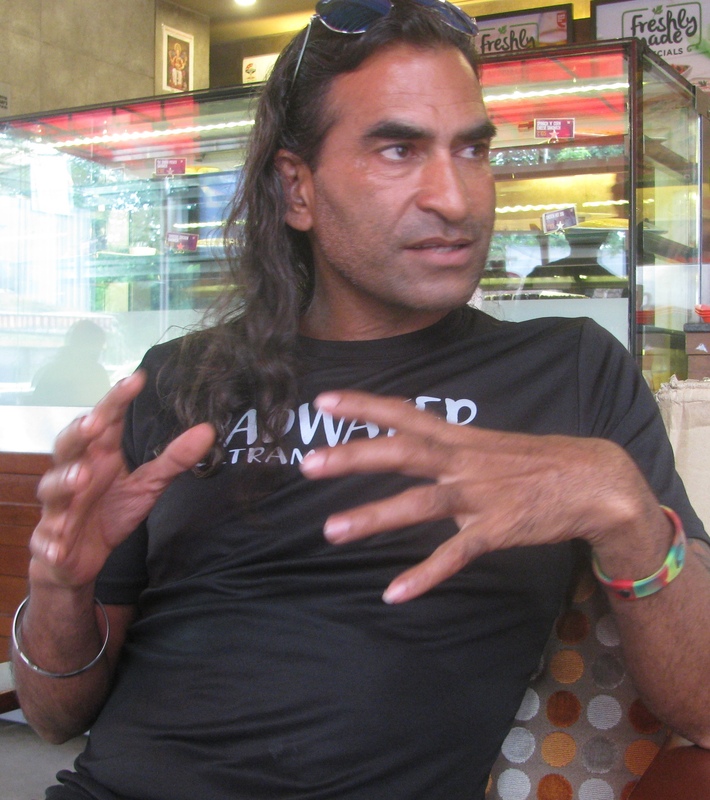 He also hopes that with Arun Bhardwaj and now him completing the race, more Indians will attempt Badwater. The race has inspired some ideas in Breeze. He would like to run the world’s top ten ultramarathons. 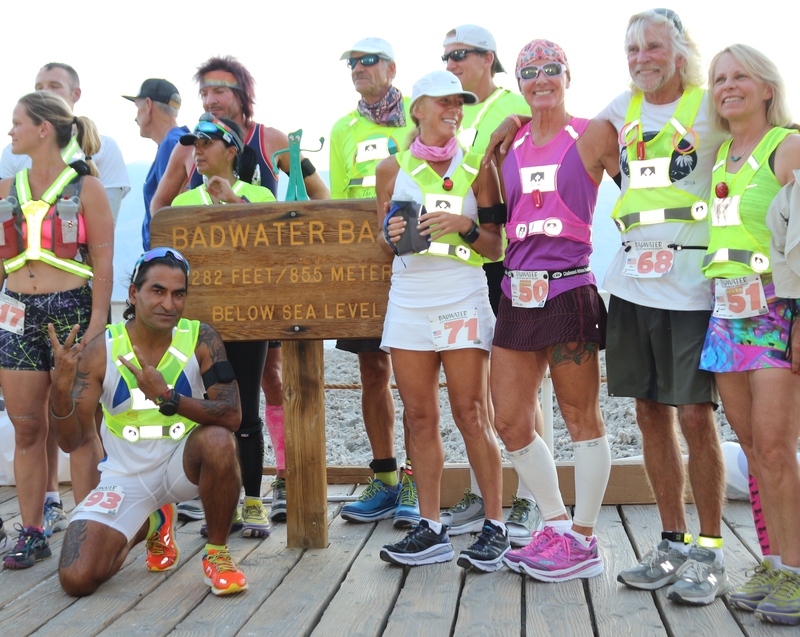 Badwater is run as a single stage race. There are multi stage ultramarathons. Breeze has his eyes on attempting the Marathon Des Sables (MDS) in the Sahara. But before that, next year, he has a pending assignment to address. On April 25, 2015, Breeze had been among those caught in a deadly earthquake-triggered avalanche at Everest Base Camp, where he was on what eventually became an aborted attempt to climb Mt Everest. 2017 is his last chance to return to Nepal and try the peak again. 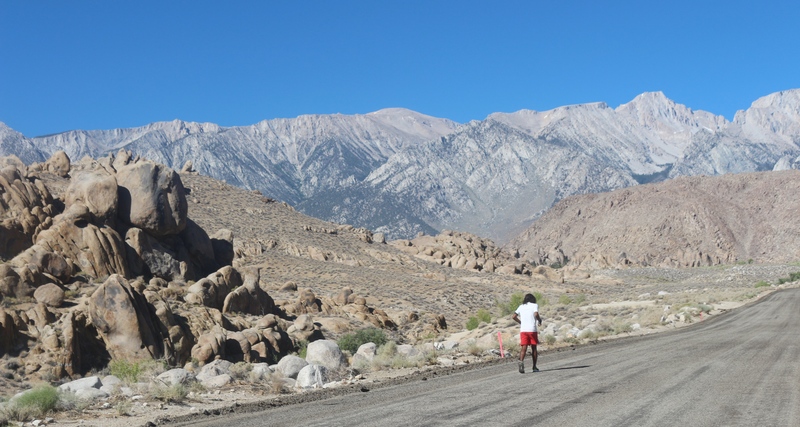 “ This year, I elected to attempt Badwater. Next year, hopefully, Everest,’’ he said.